We randomly chose a game to play on the portable arcade system and got Dommy – a Pengo style game where you matched dominos to upgrade them and then push them onto a conveyor belt while avoiding roaming enemies. No one could really work out how it scored. After that some Caveman Ninja and Magician Lord was played. 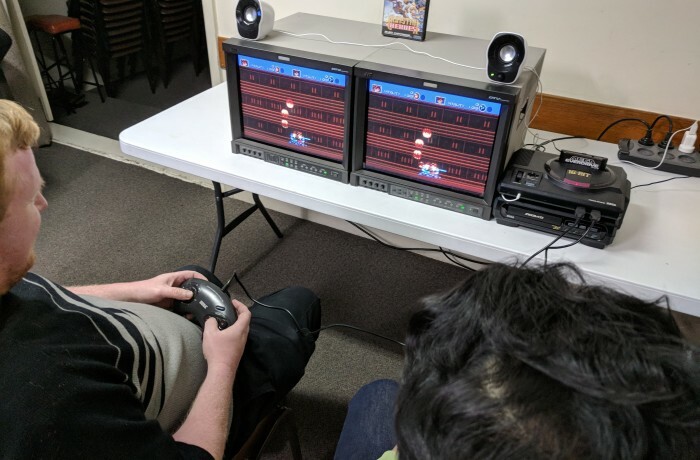 David bought along two of his broadcast quality monitors hooked together to a Mega Drive playing our game of the month Gunstar Heroes – that way both players had their own screen to look at. Robert and Angela brought along a SNES Super Scope, a CRT screen and a number of compatible games including one which appeared to revolve around shooting Yoshi in the back of the head – or maybe that was just my bad aim. John showed off his Super Wildcard DX – an attachment to his SNES which allowed him to backup his games to and play games off floppy disks. Aleks is a Treasure fan so he brought along almost every version of Gunstar Heroes to show off. William was playing SNES games from a SD2SNES Flash Cart and I was running Gunstar Heroes on a Mega Drive using a knock off cartridge – that worked OK.
During the announcements we told the members about the new Facebook group that had been created – the link above will take you there. We also announced Tuesday 17th July as our next outing to Pixel Alley – spoke about upcoming retro related releases – the games and emulators recently ported to the PS4 and Switch – caught up on the pre-sale of the Atari VCS – Tommy Tallarico’s plans for Intellivision – Sony stopping production of Vita game cards – Nintendo’s online offering – the return of the Mini Nintendo’s – Sonic the Hedgehog sneakers – recent Nintendo N64 patents – Return of Double Dragon – the sad passing of Ted Dabney co-founder of Atari – Street Fighter competitions to celebrate the 30th anniversary – Sonic the Hedgehog movie and playing external C64 games using The 64 console. We also discussed Gunstar Heroes – this month’s Game of the Month and chose Magician Lord (NeoGeo) as next months.